The autumn season screams burgundy and I absolutely love it. If you know me well then you'll know that my favourite colour is burgundy! Whether it's nail varnish, jumpers, handbags or lipstick. I love the colour and it suits my skin tone too. I do Ebay Wishlist posts every now and again and they prove to be very popular so I thought I'd combine my favourite things; Ebay and Burgundy to bring you an Ebay Wishlist - The Burgundy Edit! You can't beat a wooly hat with a pom pom on the top during the winter. 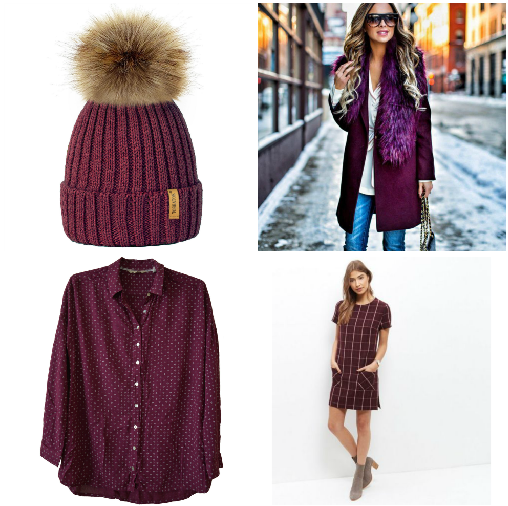 I love this burgundy one and it's so affordable, yet stylish too. It would look amazing paired with the Topshop Burgundy coat, denim jeans and heeled boots. I think this burgundy star print shirt is great for the office during the colder months and would look great with black jeans. I also love this check tunic dress from New Look which could be worn with tights or on a night out with chunky boots. I wouldn't personally wear the shirt dress on it's own as I'm a tall girl at 5 foot 10, however I would wear it with leggings or tights and boots and I think it'd look great. I love the print on this swing dress. The colours scream autumn winter and I think it would look great with black tights, chunky boots and a deep red lip (my personal fave is Rimmel 107). I've always wanted a dungaree dress and have been eyeing them up for years now. I've always been drawn to the denim ones but I think this faux suede one is a great take on the autumn season and the colour is gorgeous. I picture wearing it with a cream high neck polo top underneath with black tights and chunky boots. The perfect autumnal outfit.